There’s something so beautiful about a classic English garden, especially when it’s accompanied by tons of delicious summer berries! Am I right? That being said, you can imagine our excitement (and our fruit craving) when this stunning styled shoot by Lauren Magovern of Ladyamy Bespoke Wedding Design arrived in our inbox! The concept and theme behind the idea was ‘Something very simple, feminine and summery for a typical English wedding’, and I personally think that Laura and the whole team have nailed it! 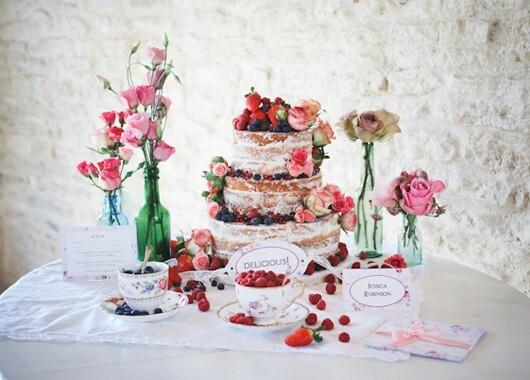 They used lots of fresh fruit and fresh flowers, with a colourful display of delicious cakes and sweet treats then topped it all off with a pretty dose of vintage china! Not to mention the selection of stunning dresses with a touch of lace detailing! It’s so English darrrrlinggggg! I told you it was beautiful didn’t I. I just love how pretty and light everything looks! How about you? Do you love this as much as us?